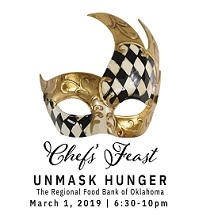 Enjoy some of the finest cuisines Oklahoma’s premier chefs have to offer at the 2019 Chefs’ Feast. The Mardi Gras-themed event features delicious food, one-of-a-kind auction items, a wine pull, fun music and more. This event benefits the Regional Food Bank’s Food for Kids Programs. Chefs’ Feast will take place from 6:30 to 10 p.m. Friday March 1, 2019 at the National Cowboy & Western Heritage Museum, 1700 NE 63 St.